Steve Rogers is a soldier with superhuman strength and an indestructible shield! Yes... "in"destructible. 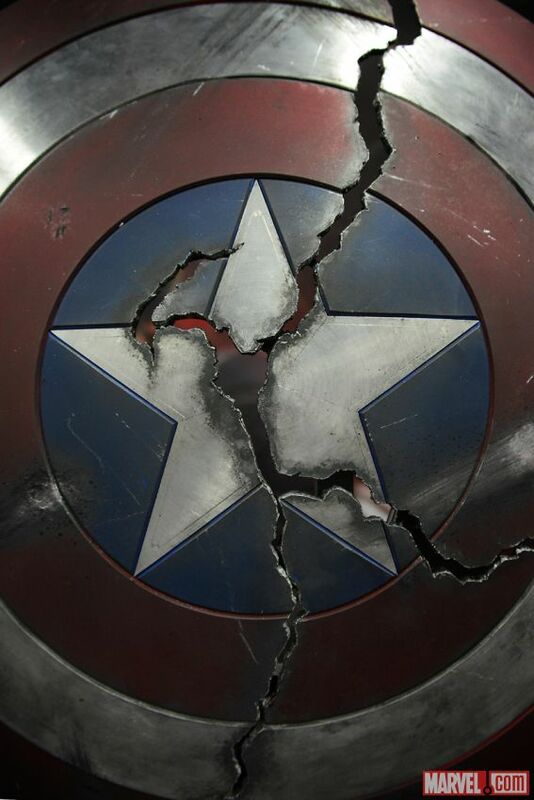 Pay no attention to all the promotional materials showing the shield broken into multiple chunks. Never happened. Nope. Captain America's suit in Avengers 2: The Prequel (aka Avengers 1) was pretty crummy. How bad was it? Hasbro made a figure of it, but I never bothered getting one. 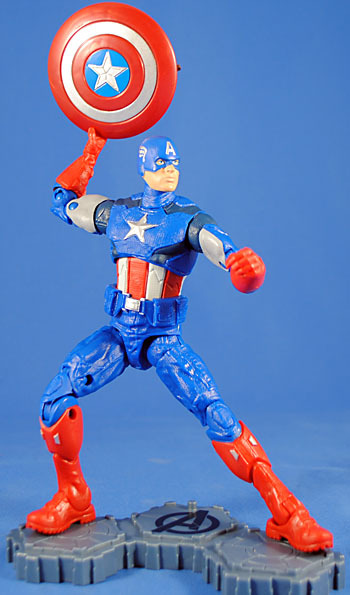 The A2 suit is better, though for this toy, most of the pieces are the same used for the Winter Soldier Stealth Cap, just repainted - not only the arms and legs, but both heads (masked and unmasked), all four hands (a set of fists, a saluting right hand, and a pointing left hand) and even his shield are all the same molds seen before. The only new pieces are the upper and lower torso, and even those have very similar shapes to the stealth suit, so the only way you'll know is to compare them side by side. The colors are not as Crayola-vibrant on this costume as they were on the first movie's toy (which was one of the things that made that one so unappealing). We do lose the red gloves and boots, which is mildly disappointing, but it makes him look more like Ultimate Captain America. If they weren't going to remold the shield to give it cracks, it really would have been nice if they'd given it a "damaged" paint app. If I were a better painter, I might do it myself. He comes with the right leg of BAF Thanos, a big and chunky piece with a lot more detail than you might expect. It moves at the ankle, shin, and double-hinged knee, and is painted a dark blue with gold and silver accents. This figure is decent, but getting it really makes me glad the first movie didn't have a BAF to force us into buying that Cap. 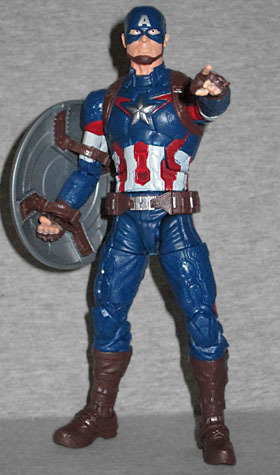 This entry was posted in blog exclusive review, Hasbro, Marvel and tagged Avengers, Captain America, Marvel Legends. Bookmark the permalink.